High Voltage DAC means: the DAC can run and generate directly high voltage output, e.g. in range of +/-18V. Before we start to design or to implement, we had to do some math and cross checks. What is the smallest voltage step we will have? Is this voltage step still above the noise level? How accurate (tolerance, correctnes even with trim) could we design the voltage divider and sum function? How can offsets, drift and temperature affect the quality? Can we use regular, cost-effective components or a need to go with higher quality? All turns out in the question: Is it really possible to provide 24bit resolution at the end? After having done some basic math it looks like it is even more challenging to get or to promisse 24bit resolution. It looks like, everybody telling you, it is an 24bit or even 32bit Audio DAC seems to talk about just the digital audio input format. The likelyhood that 24bit resolution will come out really is quite null. Even we try to use a High Voltage DAC, a high reference voltage and swing, e.g. 34Vpp, it seems to be quite impossible to generate a 24bit audio signal (which needs 144dB SNR at least). 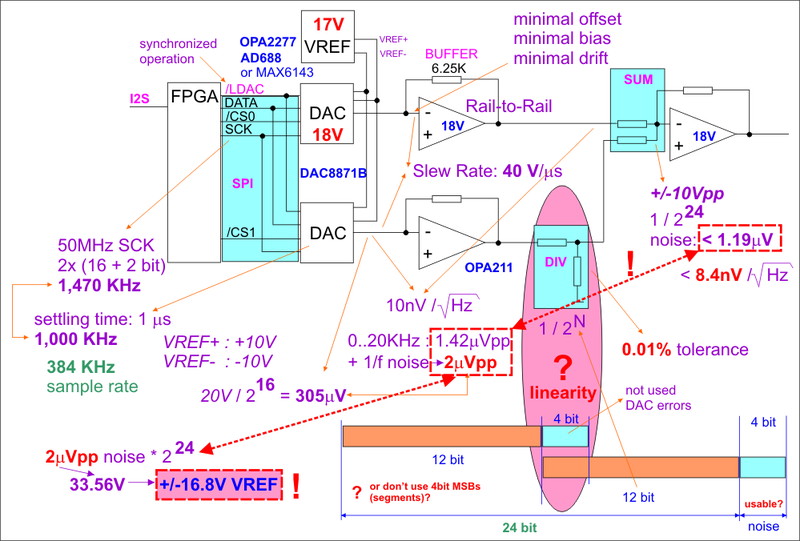 The smallest voltage step even with +/-17V (34Vpp) reference for 24bit is just 2 microVolt. BTW: I am a bit surprised: if other DAC promisse to support 24bit and they run with 5V or even with 3.3V - how can it be possible to stay away from any noise which will be there due to natural physics? Meanwhile, after all my math, I think: 24bit with a 5V DAC, even it supports as format - no way ! I assume, a DAC running with 5V supply will provide max. 20bit (120dB) resolution on audio out. If we consider how natural thermal noise, e.g. in resistors, will provide noise (BTW: which is independent of the material and type of resistor, just temperature and resistor value matters) - we see that we had to keep the resistors so small (and create a design where very high current will flow). Example: a 5K resistor with ambient temperature might generate already 3.6 microVolt noise. This will cover (hide) already 1 - 2 bit of the DAC steps. The needed accuracy of circuits, to adjust the schematics and the final setup, is so high that it might be an issue to use the right high-quality measurement equipment (e.g. to measure resistance in milliOhm range or voltages in microV range). Anyway, 144dB SNR (and 144dB Dynamic Range - which is not the same) might be not really realistic because: human hear cannot hear or utilize. The human ear might be able to consume120dB Dynamic Range. The loudest level will almost kill the ear (a starting jet plain in 1 meter distance). 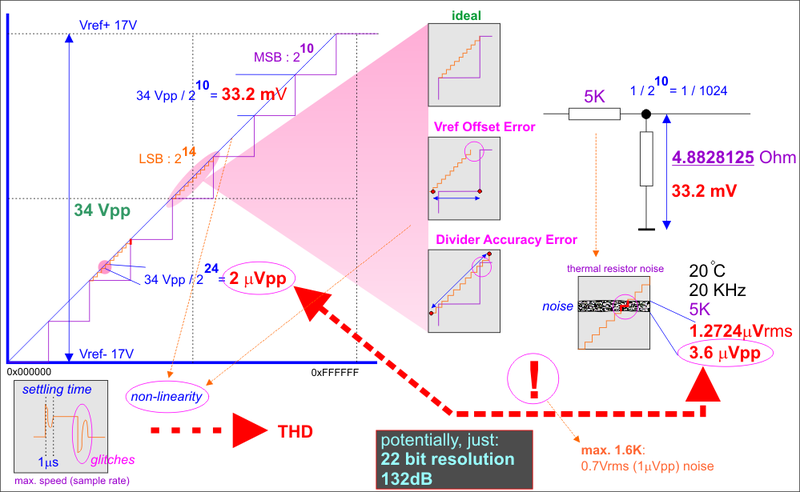 Potentially we can accept to fall down to 132dB and 22bit resolution. If we fight for highest resolution, for a Real24 DAC, even following amplifiers, output devices such as loudspeakers or headphones, will damage or not utilize this quality - keeping noise and distortion away from input and pre-processing will increase the audio quality. Question is just: if PCM1794A DAC (used on RPi-DAC) promisse to provide 132dB in 9V MonoMode then we would have already hit the possible maximum? 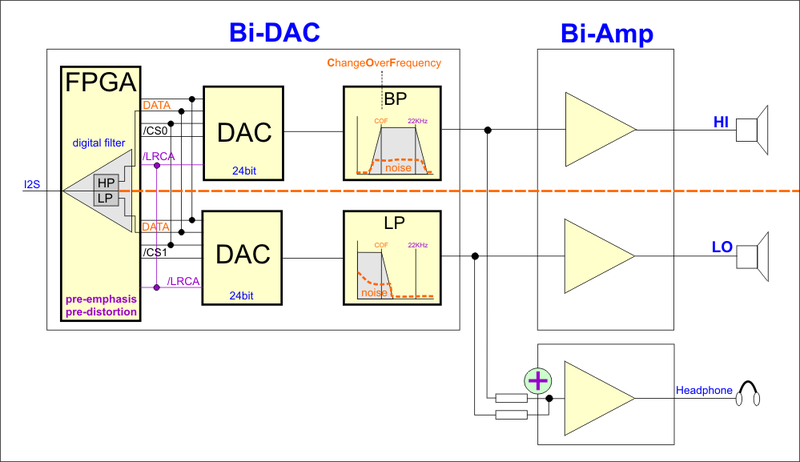 Is all the effort reasonable, is it worth to continue to think about a Real24 DAC? The speed can be higher: we can do an oversampling, e.g. generate a 384KHz signal. With higher Vref we can be more sure the signal is far away from the noise. The DAC will be a NOS (NonOverSampling) DAC, not generating artefacts and harmonics. But this is still quite challenging. Because, we had to fight for ideal linearity, to avoid to create other artefacts, e.g. due to the voltage divider or sum function, running OpAmps at their limit, as Rail-to-Rail, so that we create also distortions (and a bad THD). At the end it turns out as: a Delta-Sigma DACs as the PCM1794A used in RPi-DAC, T-DAC, are not bad. Even with Noise Shaping done by such DACs they are quite excellent already. Nevertheless, let's continue. The DAC eval boards (DAC8871) are here anyway and the ability to generate a very accurate test signal, e.g. a sine wave, is valuable enough, e.g. to act as a reference signal source for any measurement (we might not have any audio source which would provide similar quality, e.g. 144dB Dynamic Range or generated with similar equipment, without any noise, even digital). OK, new idea: the noise (spectrum) and level depends actually on the bandwidth. Sure, the higher the frequency range we consider, e.g. 0..20KHz, the more (white) noise we have to deal with. What about to filter the signal, in digital domain, to split the frequency as well (not just the voltage steps)? If we feed DACs with different frequency spectrums, low pass, high pass, one channel to several DAC, depending on frequency - could we lower the noise level to deal with? Not really sure because the DAC will not filter, it will generate still the full bandwidth, on every channel. Before we sum again and combine the final output signal, we need analogue filters. OK, they can remove the noise and make the bandwidth per partial-channel smaller. But they create also phase and potentially itself noise again which we will add together. At the end: Mister Shanon is right, there is a physical limit. We cannot sheat the physics. To fight against noise seems to mean: do not generate noise. But not to generate results in: do not process (make all resistors 0 Ohm). Uppps, chicken and egg? Uuuuhhhh, new idea: let's assume we split the frequency range, one channel with separate DACs, like a HW equalizer, but filter stage following will add phase (and distortion) - could we pre-process the audio, before we sent we will do an inverse signal distortion, a pre-distortion, so that the result as sum of both looks excellent? This is common practice, e.g. in Digital TV and terrestrial broadcast: why not doing here for high qaulity audio? Consider the entire system, feed following stages with a modified signal so that the result looks more correct. OK, an option, we have to use an FPGA anyway (for I2S-to-SPI as interface to DAC). Make it large enough to do some pre-processing and signal pre-emphasis, phase-change, anti-glitch distortion or non-linearity compensation. It results in: more math, more system design, more FPGA programming, more stuff to do in digital domain. Easy, just effort. The digital domain, VHDL or Verilog become our friends. Why not following the idea of a Bi-Amp? We split the audio spectrum into frequency ranges and let seperate DAC process it. It behaves like an Equalizer but without to combine already again. We can lower the bandwidth, the noise and even possible with voltage controlled amplifiers to adjust the signal in such a way, that every path can run with optimal performance. We can amplify a spectrum part before we let it pass a filter stage, OpAmps will run in best performance level, best SNR etc. Before we combine again all parts, we have to attenuate accordingly. Or: we output really the part of the spectrum, as separate channels: if we want to use a real Bi-Amp concept, we can feed separate loudspeakers with the signal coming really from separated DAC channels and processing. The benefit: we half the noise in every channel and might meet the constraints. And we keep the parts of the spectrum separated 'til the end of the audio path, including the loudspeakers. Bi-Amping is always quite nice.